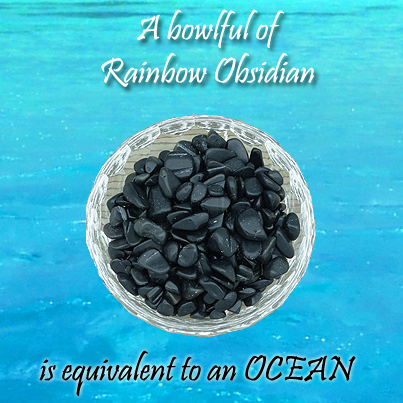 Black in color, the rainbow obsidian is a stone made up of Water Element. Featured together with a leaded crystal bowl, this bowlful of obsidian is like a few ounces of stones to bring about a few thousand pounds of water from the ocean. It is extremely suitable for the north (water), east (wood) and southeast (wood) sectors. The power from obsidian keeps negative energies away, uncover and protect against evil attempts, prevent bad intentions, arrest bad luck, provides protection, happiness, joy, creativity and for protection from over sensitivity. It has an effect during times of change, by helping to see things more clearly.Obsidian helps to protect the very sensitive against depression. It is the stone of the soft hearted and gentle people of the world. Use obsidian to help block negativity of any kind. As a black gemstone, it symbolizes self control and resilience. Black stones have protective energies in the sense that black is the absence of light, and therefore, can be used to create invisibility. Note:The wooden stand is only for photography purposes and not part of the purchase. All crystals offered by Feng Shui Bestbuy is cleansed by the singing bowl prior to customer shipment, to ensure refreshment of good chi when they reach you.